You may have seen members of this all female, flat track, roller derby team at local events, but not many people have been formally introduced. 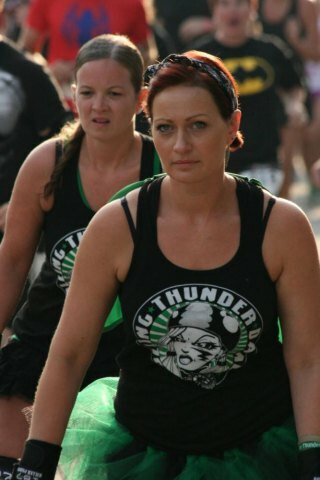 These ladies are part of The Rolling Thunder Dames, founded in 2013. As Huntington grows, the community gains access more activities, like Roller Derby right here in town. The Rolling Thunder Dames are usually seen in black and green, with their name and color to paying homage to Huntington's very own Thundering Herd. Many of the women on this team are Marshall students, housewives, business owners and career women with their ages ranging from 18-40. The Thunder Dames also have a range of skill levels and are open to anyone interested in learning about Derby. The team practices at Skateland in Altizer and are currently preparing for the 2015 season. 2015 will be the Dame's first season, with their first game in Beckley, February 28th against the Beckley Area Derby Dames. The girls also have four home games scheduled, but the current location is still up in the air. The first home game will be March 7th. The Dames are also looking for different ways to be involved with the community. The team has been seen at the Be A Hero 5K, The Color Run, The Huntington Skatepark Fundraiser, The Branches basket donation at Marshall University, Huntington's 4th of July Parade, Ashland's Christmas Parade and other events this past year. The team hopes to become a part of the community and a common household name. Keep an eye out for The Rolling Thunder Dames in 2015!